A man who gained the trust of an elderly couple, one of whom was later found murdered in Highland Beach, is accused of exploiting them after nearly $900,000 was withdrawn from their account, according to a probable cause affidavit. A man who gained the trust of an elderly couple, one of whom was later found murdered in Highland Beach, is accused of exploiting them after nearly $900,000 was withdrawn from their accounts, according to a probable cause affidavit. William and Elizabeth Cabral retired to Palm Beach County and were befriended by David Del Rio, 35, of Lehigh Acres, Fla., at the bank where they transferred their funds, the affidavit said. William Cabral was diagnosed with Alzheimer's disease and died in April 2017. Elizabeth Cabral, 85, was killed in her Penthouse Highlands condo on April 30, 2018, deputies say. While examining her banking records it was discovered that a large amount of cash had been removed from William and Elizabeth's accounts between 2014 and 2018, the affidavit said. 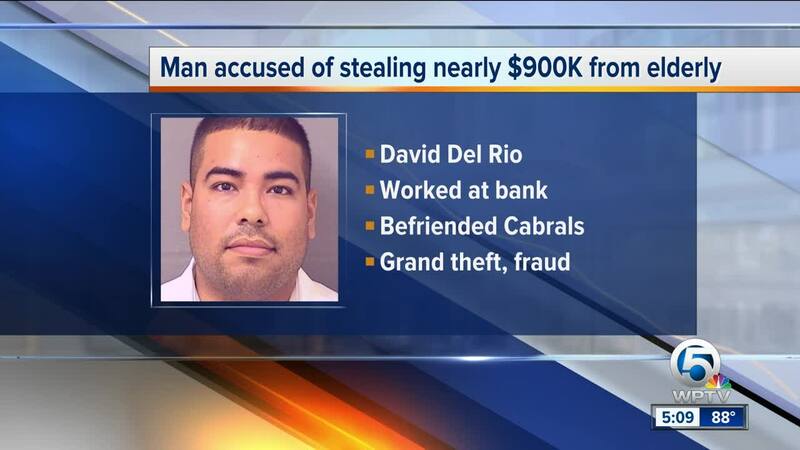 Investigators allege Del Rio, while acting under a power of attorney, breached his fiduciary duty by making financial transactions via check in the Cabrals' name into an account under his control. They say approximately $893,673.08 was withdrawn from William and Elizabeth Cabral's SunTrust account and their Bank of America account via 16 checks and deposited into an account set up by Del Rio. The money was used to pay for more than 405 personal transactions including a 2017 Audi A sedan, utility payments, home improvements, firearms, suppressors, firearms equipment and payments to Royal Caribbean Cruise line, the affidavit states. Del Rio was booked into the Palm Beach County Jail and faces charges of exploitation of the elderly, money laundering, organized scheme to defraud fraudulent use of personal ID and grand theft.